2 Why should you notice your pictures? One of the brain’s primary jobs is to manufacture images. 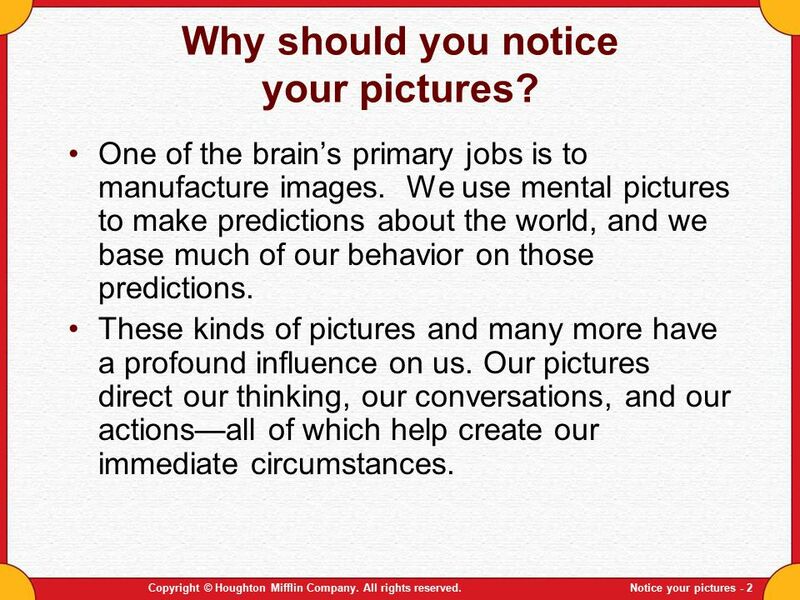 We use mental pictures to make predictions about the world, and we base much of our behavior on those predictions. These kinds of pictures and many more have a profound influence on us. Our pictures direct our thinking, our conversations, and our actions—all of which help create our immediate circumstances. Copyright © Houghton Mifflin Company. All rights reserved. 3 What do our pictures do for us? 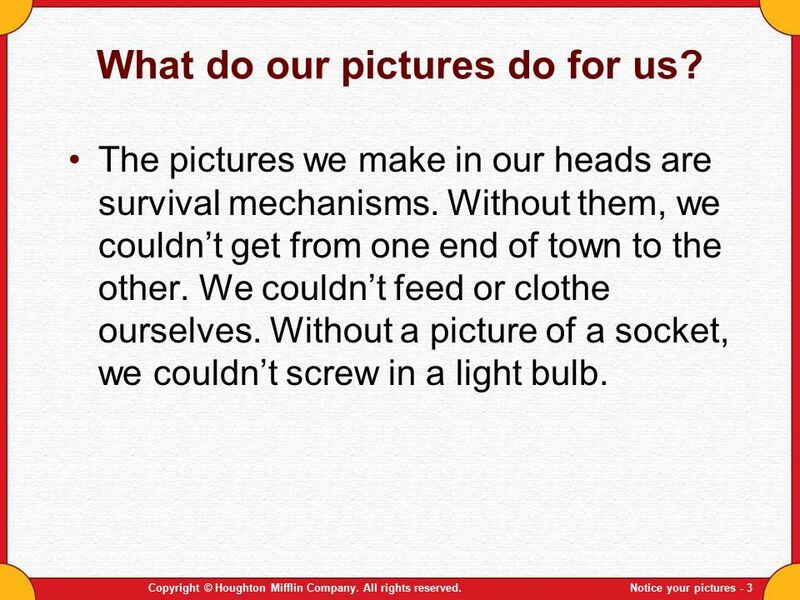 The pictures we make in our heads are survival mechanisms. Without them, we couldn’t get from one end of town to the other. We couldn’t feed or clothe ourselves. Without a picture of a socket, we couldn’t screw in a light bulb. Copyright © Houghton Mifflin Company. All rights reserved. 4 How can I notice my pictures? Be aware of them. Just open up your mental photo album and notice how the pictures there influence your thoughts, feelings, and actions. 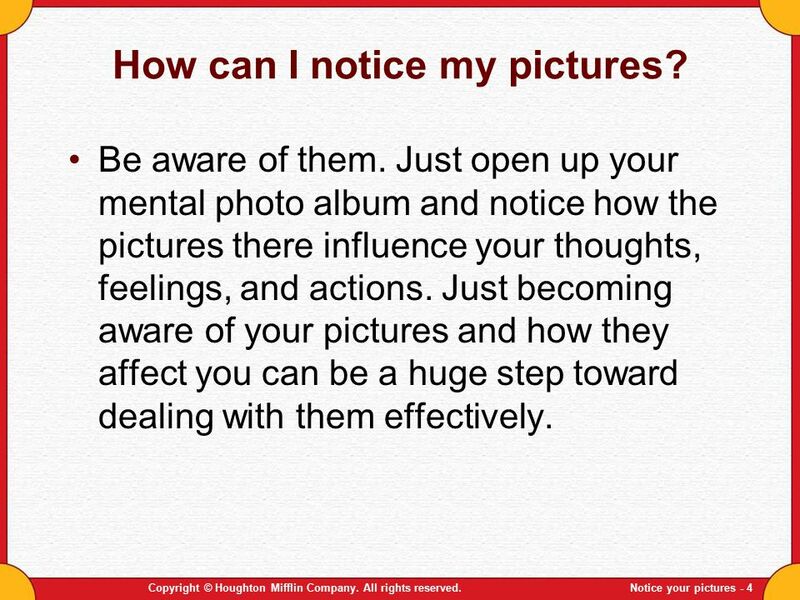 Just becoming aware of your pictures and how they affect you can be a huge step toward dealing with them effectively. Copyright © Houghton Mifflin Company. All rights reserved. 5 How Can I Let My Pictures Go? You are more than your pictures. Many images and words will pop into your head in the course of a lifetime. You do not have to identify with these pictures. You can let pictures go without giving up yourself. Copyright © Houghton Mifflin Company. All rights reserved. If this is tested the most important points are… If I needed to remember this forever… Copyright © Houghton Mifflin Company. All rights reserved. 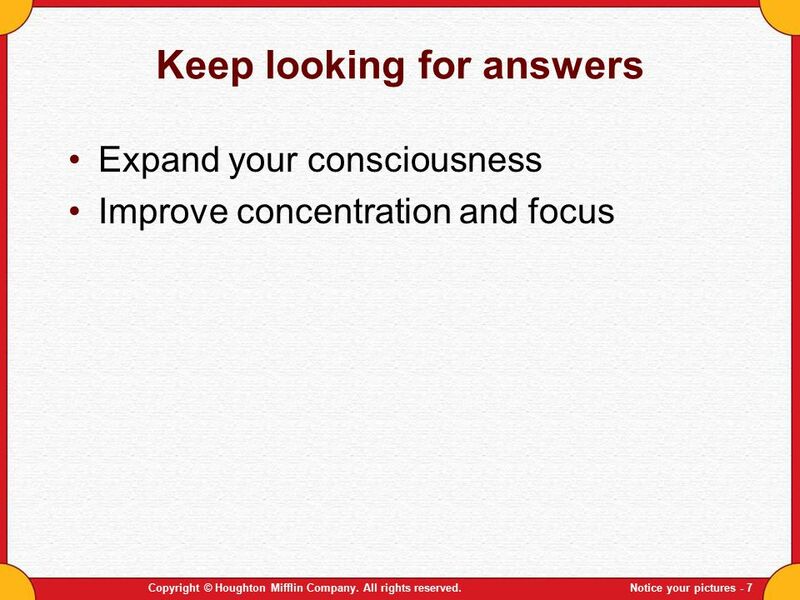 Expand your consciousness Improve concentration and focus Copyright © Houghton Mifflin Company. All rights reserved. 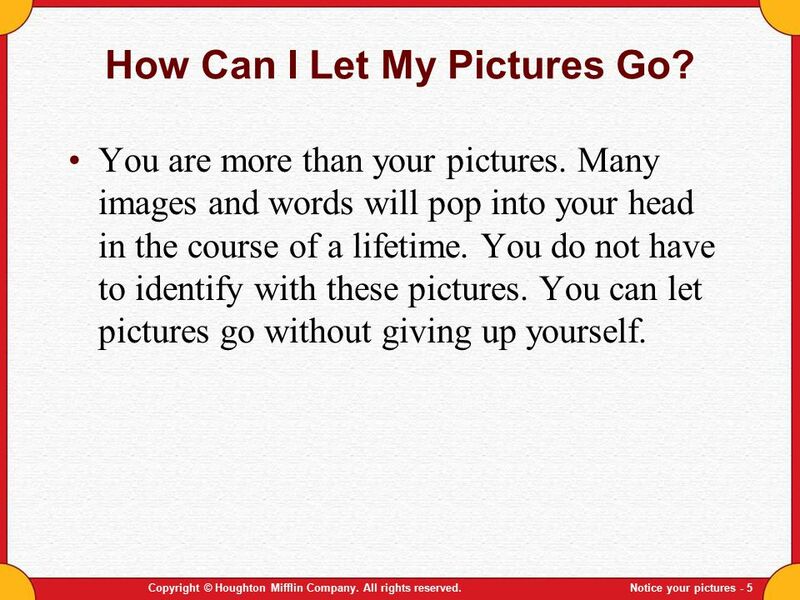 Download ppt "Notice your pictures (and let them go)"
Digital Lesson An Introduction to Functions. Copyright © by Houghton Mifflin Company, Inc. All rights reserved. 2 A relation is a rule of correspondence. Power Process Be here now. Chapter 10 Analytic Trigonometry. Copyright © Houghton Mifflin Company. All rights reserved Fundamental Trigonometric Identities. The Beginning of A Leadership Journey The journey of a thousand miles begins with one step. 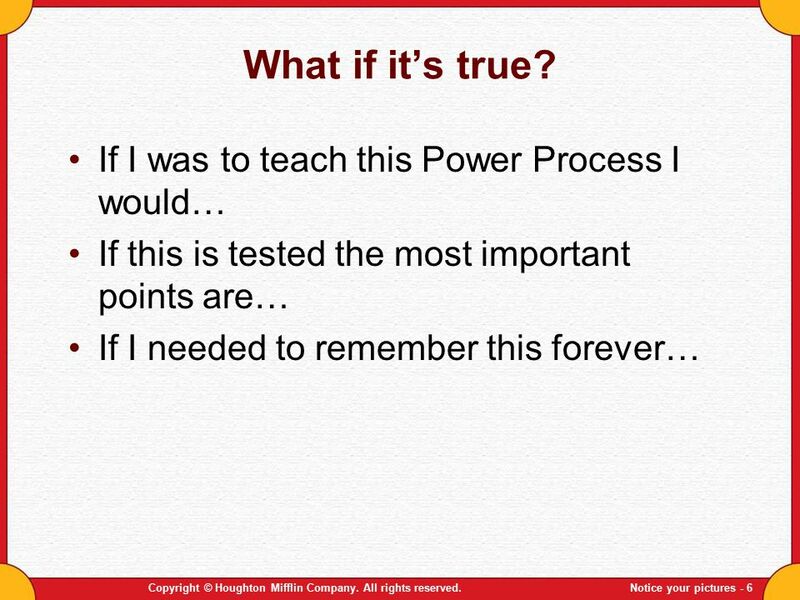 Power Process Risk being a fool. Copyright © Houghton Mifflin Company. All rights reserved.Risk - 2 Why risk looking foolish Allowing ourselves to make. Slide content created by Charlie Cook, The University of West Alabama Copyright © Houghton Mifflin Company. All rights reserved. Chapter Seven Basic Elements. 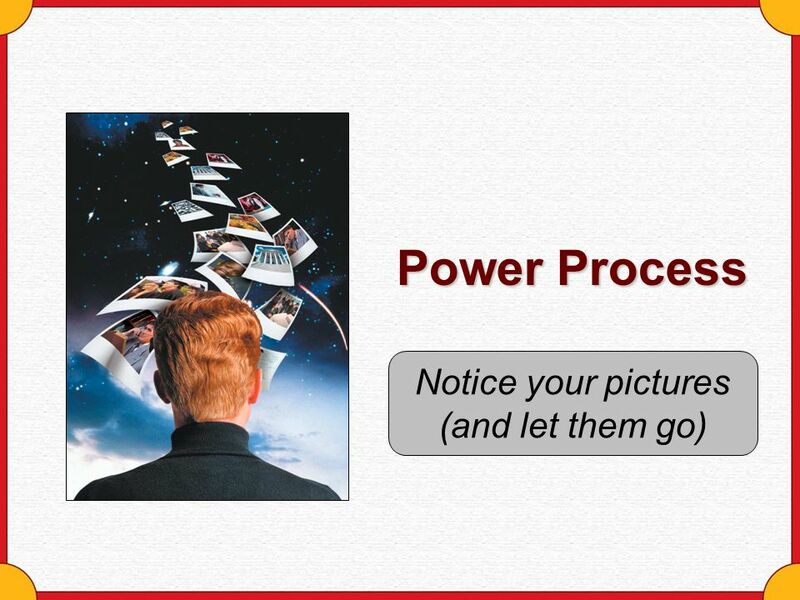 Power Process Ideas are tools. Copyright © Houghton Mifflin Company. All rights reserved.Ideas are tools - 2 Why should you think of ideas as tools? The. Power Process Detach. Copyright © Houghton Mifflin Company. All rights reserved.Detach - 2 Why detach? Attachments are addictions Attachments often cause. Copyright©2000 by Houghton Mifflin Company. All rights reserved. 1 QUESTION. Graphing Linear Inequalities in Two Variables Digital Lesson. Chapter 12 Developing Strategies for Objective Tests. 1. 2 Self and communication 3 Who am I? An exercise: “Who am I?” ■ Ask yourself this question. ■ Answer on a piece of paper. ■ Write as much as possible. Theorems of Welfare Economics Welfare Economics and Public Goods. Chapter 6 Boosting Your Memory and Preparing for Tests. 1.5 Infinite Limits. Copyright © Houghton Mifflin Company. All rights reserved Figure 1.25. Copyright © by Houghton Mifflin Company. All rights reserved. 1 Measuring the Income Distribution Describing the income distribution. The Lorenz Curve. Prior Knowledge: Activating and Developing Concepts and Vocabulary Chapter 3.